At 12,507 feet, Lake Titicaca is the highest navigable lake in the world. Shared by Peru and Bolivia, each claims its most picturesque views. While visiting Peru, I set out to immerse myself in the rural indigenous culture of the small villages on the islands of Lake Titicaca. My experiences were authentic and, in some ways, life-altering. For readers who are seeking an authentic cultural experience, this is where to find it. Boarding the tiny boat at the dock in Puno, I already doubted the wisdom of my decision. I was apparently the only person over 50 on the boat—well, the BOAT may have been over 50, but that didn’t ease my nerves. We were bound for a two-day tour of three islands. I was just hoping not to end up like Gilligan’s crew. Our first stop was the floating Uros Islands. This group of about 40 small islands is home to 2,000 people from the Uros tribe, one that pre-dates the Incan civilization. The islands are built exclusively from totora reeds that grow in the lake. The versatile reeds are also used to make their houses and boats as well as serving as medicine and substance. According to Uros legends, the tribe existed before the sun when the earth was still dark and cold. They were impervious to drowning or being struck by lightning. Disobedience to the universal order and mixing with humans cost them their status as super beings and they scattered, losing their identity, language and customs. They became the Uro-Aymaras and now speak Aymara. Today the natives survive by fishing, but tourism provides most of their income. Villagers demonstrate their many uses for the reeds as they hawk their handicrafts. I was invited to ride in one of the reed boats as the children serenaded me. Initially, it seemed a bit Disney-esque until I remembered that I was, in fact, walking around on floating islands made entirely of reeds in the middle of a lake in Peru with a tribe that began from super-human beings. Disney can’t do that. We said goodbye to the Uros tribe with their impossibly cute singing children and boarded the dilapidated boat once more. It chugged and sputtered another three hours further into the lake to reach Amantani Island. Our group would be splitting up on the island to spend the afternoon and night with our host families. Staying in a houseful of strangers didn’t concern me—the possibility of no indoor plumbing did. I was met at the dock by my host, Gladys. Getting to her home wasn’t easy as we scrambled up steep embankments that left me gasping for air in the high altitude. It was worth the effort when I saw my room with its very own private bathroom. It turns out it was one of the only homes with indoor plumbing in the village. Maybe someone knew I was the oldest in the group and took mercy on me—score one for being over 50! The afternoon began with a typical lunch of quinoa soup followed by the main course of three types of potatoes (Peru has over 3,000 varieties), carrots and other vegetables. Accompanying the soup were warm loaves of bread baked in a primitive wood-burning stove and coco tea. The lack of a common language made conversation a challenge, but we still managed to communicate. After lunch, I explored the island with a stroll around the Plaza de Armas and nearby pathways. Curious village children, donkeys, horses and sheep accompanied me on my walk. The village men waved from the plaza steps where they were enjoying an evening beer. It was happy hour Amantani style. As the sun set and darkness crept in, Gladys’ young daughter ran to find me to share her flashlight. Little gestures of kindness from strangers one of the things that makes the homestay experience so special. Admittedly, homestays aren’t for everyone. Don’t expect luxury or even indoor toilets. But if you are up for the adventure, the experience provides a unique opportunity to connect with the local culture, customs and most importantly, people. Relatively isolated from Peru’s mainland until the 1950s, the villagers of Taquile Island have maintained a powerful notion of community and family. Taquile is known for its knitted and hand-woven textiles and clothing and has earned UNESCO World Heritage status for its traditions. The knitting is done exclusively by the males who begin learning the craft when they are eight years old. Women and girls are responsible for making the yarn and weaving using traditions dating back to early civilizations. Some methods still maintain elements from pre-Inca Andean cultures. A long narrow trail led up from the boat dock up to the main plaza winding past ancient agricultural terraces and ruins dating back to pre-Inca times. The views of Lake Titicaca below and Bolivia’s mountain ranges in the distance were stunning. 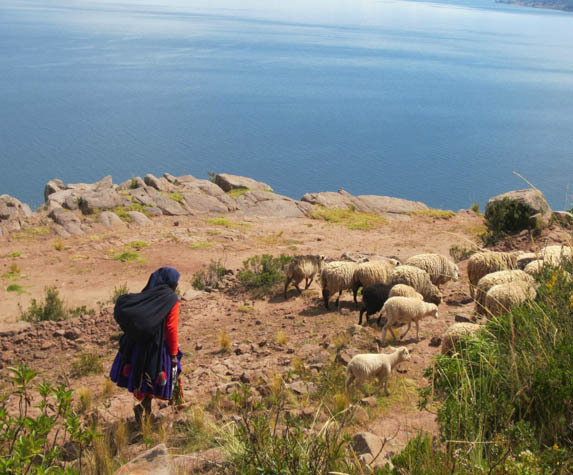 As we sat perched on an ancient terrace overlooking the azure waters of Lake Titicaca, a woman in traditional clothing passed beneath us as she herded her sheep. For a few moments, I felt as if I had truly found a place untouched by time. Have you ever explored the islands of Lake Titicaca?